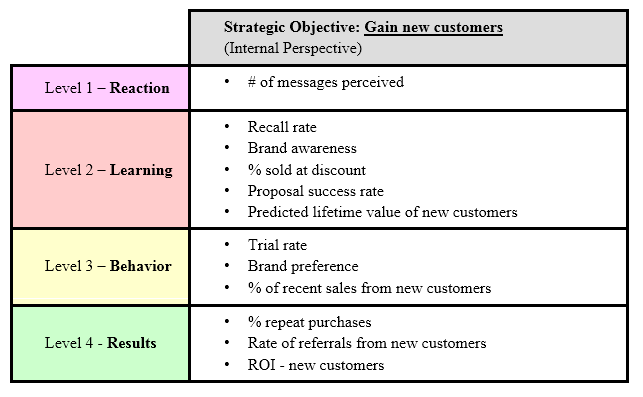 Donald Kirkpatrick’s four levels of evaluating training effectiveness can be applied to the development of key performance indicators (KPIs) to track strategic performance across organizational Balanced Scorecards (BSCs). Step One: Determine how the trainees feel about the program. Step Two: Determine how much the trainees learn in the form of increased knowledge and understanding. Step Three: Measure the changes in the on-the-job behavior of the trainees. Step Four: Determine the effects of these behavioral changes on objective criteria such as production, turnover, absenteeism, and waste. 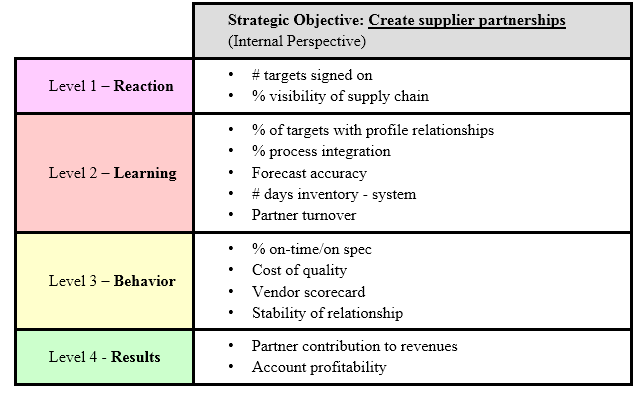 The enterprise-level Balanced Scorecard focused on 15 KPIs which measured strategic outcomes for their strategic objectives. Each successive layer below the executive team had fewer KPIs: 12, 10, 8, and 5, respectively. The tables above served as guidelines to help each line or support organization identify their own, critical few KPIs measuring how each team, department, function, or unit supported the layer above them and, ultimately supported the enterprise’s strategic objectives and its associated outcome KPIs. Over time, each organization’s KPIs became more refined to reflect more authentic evaluations of performance using progressively higher Kirkpatrick levels, particularly Learning and Behavior.